Dad needed a small nightstand for his clock and the control to the heated mattress pad. The chest of drawers next to the bed is too tall to reach the control or see his clock. I made him this little nightstand to fit between the bed and chest of drawers. It is 12” wide by 18” deep by 24” high. 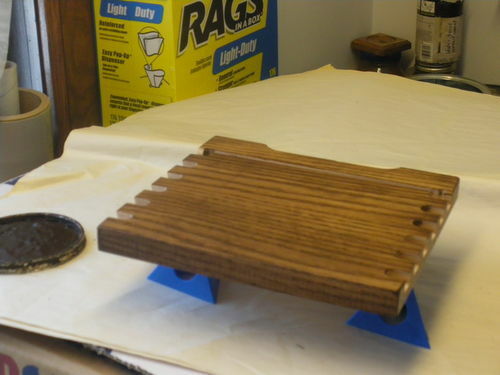 I made it in the same style as I had made the little side table for Mom’s crocheting. I think furniture should serve a purpose beyond just collecting “stuff” on top of it so I put in a small drawer with an insert to hold Dad’s hearing aids. Dad is still doing well at 101 years old so I hope he gets many years of use from this piece of furniture. Very nice! You do great work. Thanks Janice. So do you do great work!! 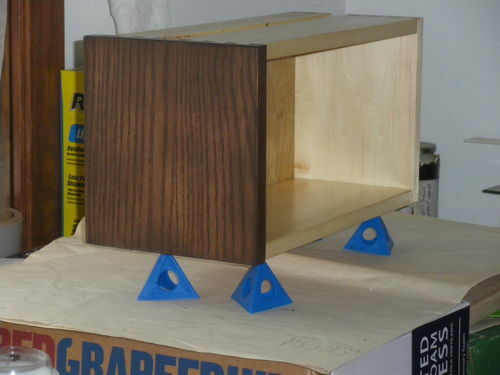 very nice job,clean simple design and great looking dovetails.did you cut those by hand or use a jig? i hope your dad gets to enjoy that beautiful table for many years too. Love it. How did you not get stain on the drawer side? I assume the face was stained first, but then that raises the question of how you smoothed the drawer after assembly without sanding/planing into the finish. Thanks for your nice comments. Those dovetails were cut with a cheap dovetail jig and router. I wish I were good with hand tools, but I’m totally inept. It would have been nice to learn to use hand tools when I was still young but as slow as I am even with power tools and as many projects as I still have left to accomplish, I hope I can still work like Dad does when I’m 101! Those dovetails were cut with a cheap dovetail jig and router. I wish I were good with hand tools, but I m totally inept. It would have been nice to learn to use hand tools when I was still young but as slow as I am even with power tools and as many projects as I still have left to accomplish, I hope I can still work like Dad does when I m 101! how we get to the finish is not important as how we finish,and you came in first.as far as dad,me too-lol. Thanks for the encouraging words. To answer your question: I dry-assembled the drawer and sanded everything smooth. Then I disassembled it and stained the front. When the stain was dry, I glued it together and varnished the entire drawer three coats. It’s not as smooth as it would have been if glued and sanded first, but photos can hide a lot of imperfections. Great looking project. The added drawer is a definite bonus and the dovetails look really nice. Neat to build projects to meet a need (much better than shopping to try to find something that is “close” but not really a fit). BB1, I appreciate your kind words. I’m a very practical person so I’m much more about needs than wants. It feels good to be able to meet those needs when I can. Very nice work for your 101 year old dad, that’s amazing and wonderful! I’m sure he treasures your work! Thanks Kim. And my Dad’s a pretty amazing man!! Ditto to all the above, a wonderful gift for who I’m sure is a wonderful man. I also really like those dovetails and the tapered legs. Just a question (NOT a criticism) as I’m very new to this process and still trying to learn—it looks like you used pocket holes to attach the legs to the panels. Are you concerned about restricting the wood movement across the grain in the panels, or are they too small to really be affected?